In general, men and women had different roles in the society of Ancient Egypt. However, unlike in many ancient civilizations, women were considered men's equals under the law. Just like men, women could run businesses, borrow money, and own property. Because women did not become scribes or work in the government, they did not learn how to read or write. They were taught homemaking skills and how to manage a household by their mother. Girls in Ancient Egypt got married very young. Usually around the age of twelve or thirteen. The Egyptians did not have big marriage ceremonies and most marriages were arranged by the two families. Women typically worked around the home. They prepared food, cooked meals, cleaned the house, made clothing, and took care of the children. Poor women would help their husbands work the fields. Wealthier women would manage the servants or perhaps run a business of their own. Preparing food for the family was a full time job for most peasant women. They would tend the garden, ground grain into flour, knead flour into dough, and cook bread. Wealthy women would have had servants to do most of the housework and cooking. They would spend their time managing the servants and planning large banquets. Sometimes wealthy or high-ranking women became priestesses working in a temple for one of the Egyptian goddesses. Only women from important and high-ranking families would have been allowed to become priestesses. Working in a temple was considered an honor. 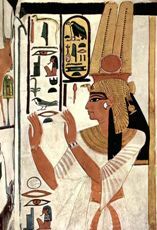 There were many powerful women goddesses in the Egyptian religion including Isis (the mother goddess), Hathor (goddess of love and motherhood), and Nut (goddess of the sky). Not all women worked in the family home or conformed to the typical roles of women. In Ancient Egyptian society this was okay. Women owned businesses selling products such as cosmetics, perfume, or clothing. Some women worked as entertainers in the courts as musicians or dancers. Although women had less opportunity than men, they had the same legal rights. In some cases, this allowed a woman to rise all the way in power to become pharaoh. Two of the most famous women pharaohs were Hatshepsut and Cleopatra VII. Husbands and wives were generally buried together in the same tomb. Pharaohs were the exception and were usually buried separately from their wives. Family was very important to the Ancient Egyptians. Most men only had one wife and both men and women were expected to be loyal to their spouse. Women wore long, lightweight dresses made of linen. They also wore jewelry and makeup to protect their eyes and skin. Although women had equal rights under the law, they were generally considered lower than men in Ancient Egyptian society.